Although it seems Mother Nature isn’t fully committed to allow the spring breeze to bathe us with balmy Gulf air, this week has started to show significant changes in the birds on the Island. It seems most of the waterfowl and raptors have left the Island and I haven’t seen a single Sandhill Crane since March 1st. The shorebirds and wading birds are migrating through in larger numbers and early purple martins and swallow species are showing up. Several species are already showing off flashy breeding plumage, exhibiting courtship behaviors or even nesting. White-winged Doves (pictured above), Mourning Doves and Eurasian Collared Doves started showing up in higher numbers and on a consistent daily basis in my property surveys since about mid-February. Their abundance and activity has been very noticeable over the past week with increased courtship behavior across all 3 species. Most bird species go through a profound plumage change as their hormones surge with the inceasing daylight hours in the spring. They transition from the more drab coloration known as basic plumage to the more colorful alternate (or breeding) plumage. In addition to more brilliant pigmentation within the feathers, many birds will develop brighter colors on their exposed skin like their legs and feet and the skin around the base of their bill and around their eye. 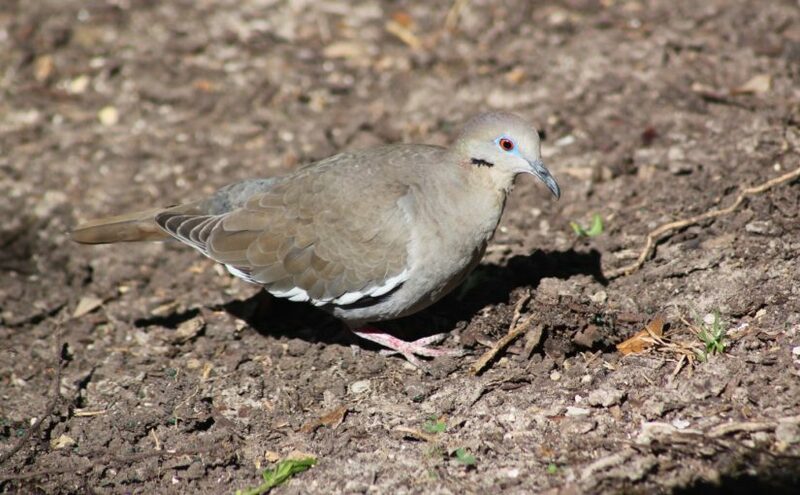 The WW Dove pictured shows bright blue skin around the eyes and at the base of the bill and more brightly contrasting black, white, gray and brown feather coloration than during winter. Since most birds see color differently than humans and their visual acuity drifts further into the ultraviolet spectrum, much of the alternate plumage may appear more iridescent or reflective to us rather than having eye catching visual color. This makes sense from an evolutionary perspective. To other birds they appear eye popping, but to most of the rest of the animal kingdom that might find them tasty, they may still have a natural camouflage appearance. Be mindful of our early nesting species as you continue to hack down all those cold-killed landscapes around your home. The Moody Gardens property surveys continue twice daily as my schedule allows and through 9 March I have tallied 96 species for our main property with an additional 10 species at the Golf Course. Since the last blog post I’ve seen Black-bellied Whistling Duck, Turkey Vulture, Dunlin, Western Sandpiper, Lesser Yellowlegs, Least Tern, Black Tern, Barn Swallow, and Sedge Wren here on our main property and added Ring-necked Duck, Greater Scaup and Bronzed Cowbird at the Golf Course. Previous Previous post: Birds of Moody Gardens – Goodbye Winter, finally!